There’s nothing better than creating new outfits from clothes already in your wardrobe. I love to mix and match and find new ways of wearing the same things over and over again. It makes me feel better about life. 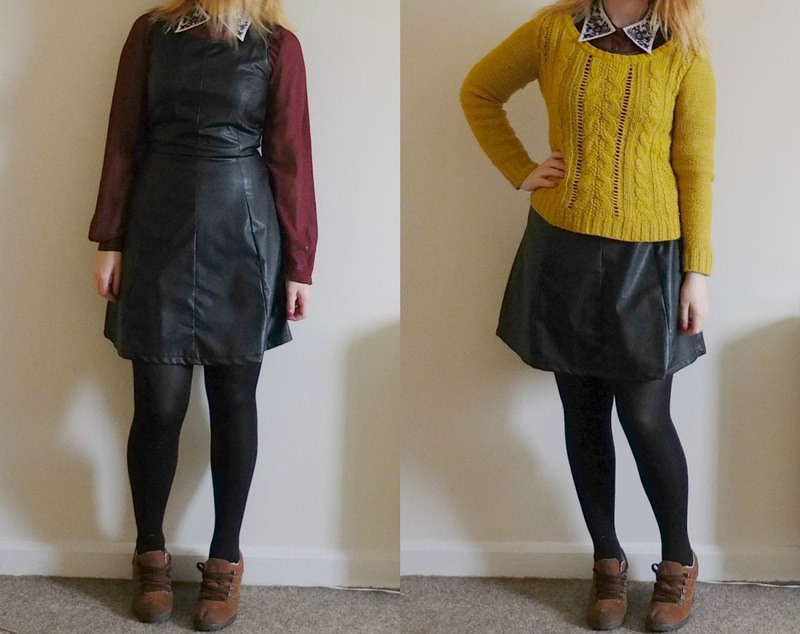 I bought this ‘pleather’ dress from the £6.99 shop in Birmingham a few months ago (and you may be able to guess, it cost me £6.99) and I really love the style of it. However, I kind of don’t like that due to the material, which is a faux leather, people think it’s some kind of perve-ious piece of clothing you only wear to be provocative – that ain’t what I’m going for at all with my cutesy demeanour. I do find the cut of the dress endlessly flattering though so want to wear it more! So I layered that bad boy up to wear it in the daytime. 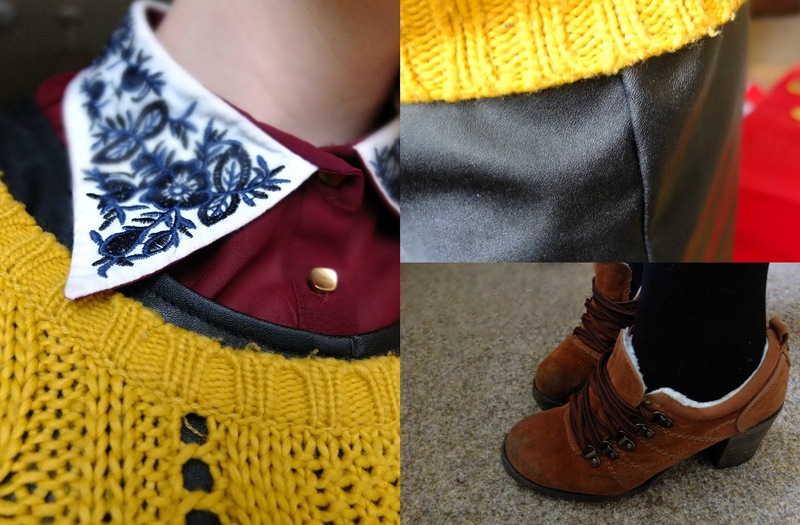 I love my trusty mustard jumper. I bought it from Primark years ago and despite it having a rather large hole in the arm pit I still wear it like there’s no tomorrow. I also popped on my embroidered collar shirt from Primark too for added warmth – you know how chilly this time of year can be *cough*. Teamed with these shoes I forgot I owned from Deichmann it turns out to be a pretty versatile ensemble, as the jumper can just be whipped off for the evening and the shoes are comfy enough for in the day. The dress is also really nice on it’s own for an evening out. I don’t often go out with bare legs but I felt that with the material and with black tights I looked a little too dark for a gin infused evening of dancing to Thrift Shop. 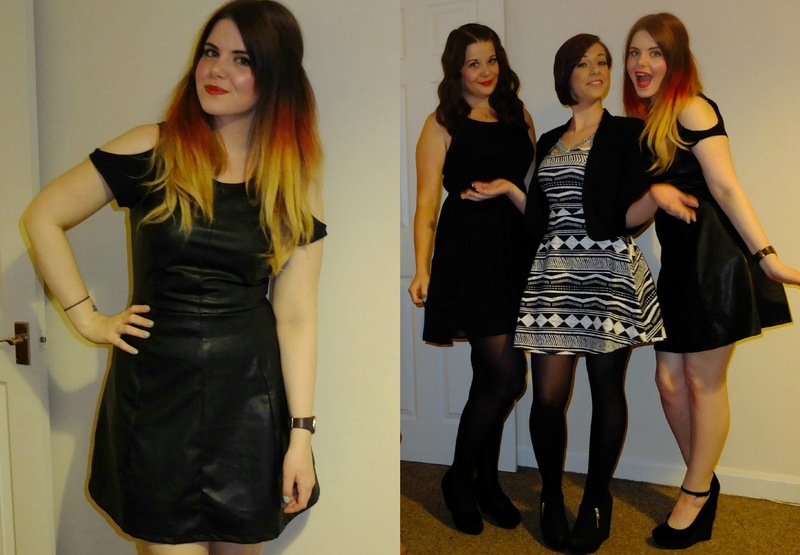 During this night out I also fell over several times but didn’t ruin the dress. What can I say? The material is very forgiving. Because I’m one of those girls endlessly conscious of my big arms I did pop a cut out shoulder T Shirt underneath to break the fleshy bits up a little though.